Aqueous fluid inside the eye is produced by the ciliary body. The bulk of this fluid passes through the pupil and out of the eye via the trabecular meshwork. This is the main drainage mechanism of fluid from the eye. The trabecular meshwork is located in the periphery of the anterior chamber of the eye in the region where the iris meets the cornea. This area is called the “angle “ of the eye. In an eye with normal pressure aqueous fluid produced by the ciliary body is balanced by drainage through the trabecular meshwork. If this area is narrow it can cause impaired drainage of fluid out of the eye and raised intraocular pressure. Raised intraocular pressure can lead to glaucoma. 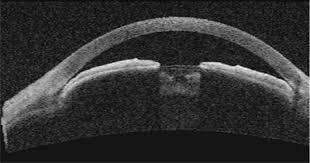 Patients with narrow angles are at higher risk of developing acute angle-closure glaucoma which can cause a permanent complete loss of vision very quickly. To prevent this occurring in patients with narrow angles , laser peripheral iridotomies are performed to allow increased access of aqueous fluid to the trabecular meshwork.